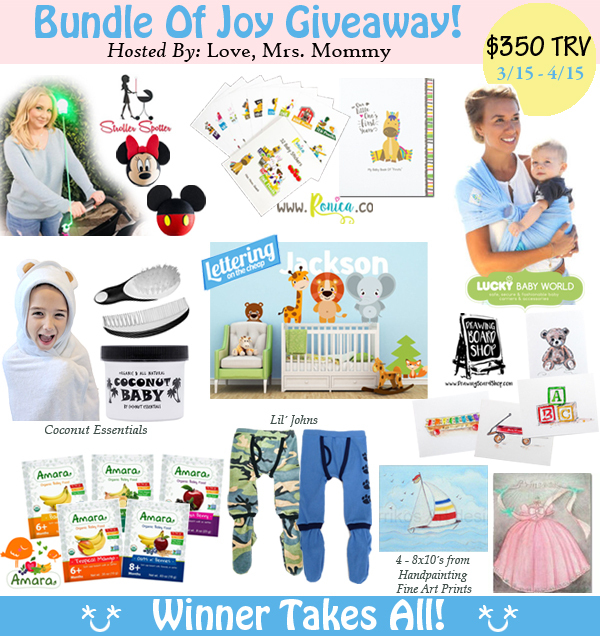 Bundle of Joy Giveaway! $350 in Prizes! $350 worth of goodies from 9 Sponsors! $25 Gift Certificate to Stroller Spotter! Stroller Spotter is an 18" illuminated antenna for strollers that allows parents to find theirs quickly in a crowd, as well as display a favorite topper. $25.00 RV! A farm theme modern photo journal and keepsake album & a 32-Pack of 4" top-end baby onesie stickers! $59.98 RV! Sukkiri Baby Ring Sling! This mesh ring sling is light, breathable, adjustable and one-size-fits-all! $35.99 RV! A Brush & Comb Set, 100% Organic Hooded Towel and Coconut Baby Moisturizer! $48.89 TRV! Winner's choice of any four, 8x10 prints! Pick out a set of 4 prints, or mix and match! $54 RV! $50 Gift Certificate to LetteringOnTheCheap.com! Design lettering or pictures for the walls of your baby's nursery. Check out Love, Mrs. Mommy's contributing writer's review of Lettering On The Cheap right here! $50.00 RV! $25 Gift Certificate to purchase yummy, organic baby food for your little sweetie! $25 RV! Winner's choice of size and style (Lil' Original or On The Go Camo) Lil' Johns! Great way to keep your baby warm during the colder months of the year! Check out Love, Mrs. Mommy's video review here! Up to a $29.95 RV! Receive this 3 card set of childhood firsts + 1 additional teddy bear note card from the Drawing Board Shop! All hand-painted cards! $21 RV! What a wonderful giveaway. I know you all get this often but thank you. Kids Powpro Digital Video Camera Giveaway! Natural At Home Remedies for Tummy Aches! It's a Baby Shower Gift Guide Giveaway!